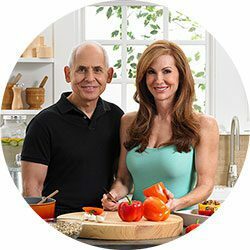 Fuel your body with brain-healthy foods and supplements in order to optimize your brain and fight Alzheimer's, depression, obesity, and a host of other illnesses with the help of New York Times bestselling authors Daniel Amen, MD and Tana Amen, BSN, RN. The Brain Warrior's Way is your arsenal to win the fight to live a better life. The Amens will guide you through the process, and give you the tools to take control. So if you're serious about your health, either out of desire or necessity, it's time to arm yourself and head into battle. In The Brain Warrior's Way, Daniel and Tana share how to develop Mastery over your brain to prevent Alzheimer's disease, combat depression, reverse aging and improve overall health. In these books, you'll find over 100 simple, delicious recipes that support the principles of the Brain Warrior's Way to heal and optimize the brain–an essential resource for anyone who wants to provide their bodies with the proper fuel to boost energy, focus, memory, and improve your quality of life. Daniel G. Amen, MD, is a psychiatrist, teacher, and ten-time New York Times bestselling author. He is one of the world's foremost experts on using brain imaging tools to help optimize and treat his patients. Amen Clinics have one of the highest published success rates for patients. He is the producer of ten highly popular shows about the brain, which have raised more than sixty-five million dollars for public television. His work has been featured in The New York Times Magazine, The Washington Post, Men's Health, and on The Dr. Oz Show and Dr. Phil. Tana Amen, BSN, RN, and VP of Amen Clinics, is the author of 6 books, including the New York Times bestseller The Omni Diet. She is a highly respected health and fitness expert, and a nationally renowned speaker and media guest. She has appeared on The Doctors, Today, Good Day New York, and more. Additionally, Tana's appearances on public television promoting brain health have helped raise millions of dollars for local stations. "Daniel Amen's The Brain Warrior's Way, Ignite Your Energy and Focus, Attack Illness and Aging, Transform Pain into Purpose is beautifully written and provides a state-of-the-art plan to win the war on optimal brain health and function. It is easy to read, simple to implement, and with groundbreaking material that will help you to turn back the clock on aging. "– Steven Masley, MD, FAHA, FACN, FAAFP, CNS, bestselling author of The 30-Day Heart Tune-Up and Smart Fat. Delicious, healthy and smart recipes combined with gorgeous pictures make this cookbook worth your time and effort. I have small adhesive tabs marking my favorites for easy reference. This is my go to cook book for good brain health. I make the banana pancakes, smoothies, weekly. Thank you for all the helpful tips as well! This book is really beautiful and creative. Rich of delicious recipes and inviting pictures. It is complete with descriptions and instructions on healthy cooking methods, and healthy choices, so as Dr. Amen and his wife recommend in the Brain Warrior book. I like many of the recipes, but did not have chance to try all yet. I do like one in particular that is easy to make, âThe orange, fennel and blueberry salad". But there is a lot more than simple salads! Love this cookbook! Delicious and easy to prepare recipes especially for the novice cook! Hope Tana will write another soon!